Getting sick of sticking in a space of boringness and drabness day over day again? Wants to change a different environment but doesn’t want to punch a hole out of your wallet? Don’t worry, we got your back! 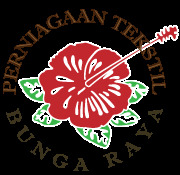 Perniagaan Tekstil Bunga Raya (Tangkak) Sdn Bhd is a one stop service business for your curtain, fabric etc, our product helps you to change your surroundings to a completely budget self-made paradise! Condominium, school, hotel, restaurant, bungalow, office, or retail shop, we got you covered. Our workers are also capable with professional sewing skill just to ensure that every product we serve to you are in the best condition at all time! We are providing measurement service for you as well. Whether you are preparing wallpaper for the whole house, or just a new fabric for your pillow, we always give you our best advice on how much fabric do you need with our heart and soul so that you can decorate up your space without wasting any cents. You might be confusing,” How is it possible that a piece or two of fabric can change my life? You must be kidding.” Of course, we can’t do if we only have a peace or two fabric for offer, but we are having a wide selection of fabrics design for your choice! No matter you are a minimalist lover, color advocates or a black and white lover, we got tons of designs to fit your need! Whenever you need a budget and big change in your place, we are always glad to be part of your wonderful perfect life.